Although some people may think wine decanters are for looks only nothing could be further from the truth. Decanters are an important tool that can actually increase your enjoyment of the beverage. Decanters serve two basic purposes, besides looking great on the bar or buffet. When you pour wine into the decanter from the bottle properly, it allows the sediment to separate from the wine. This is especially important for older wines, because they have a tendency to have more sediment which may impart a bitter flavor. Having bits of something floating around in your glass can be less than appetizing as well. The other reason wine is better after it is decanted is that during the pouring process, the liquid mixes with oxygen, enabling the flavors and aromas to develop fully. Wine should be splashed into the decanter, allowing the most contact with oxygen possible. Finally, decanted wine is pretty. The clear glass shows off the color of the wine. Decanters are not meant to be used for storage, however. Wine will turn very quickly after it has been decanted. Wine has been part of human culture for thousands of years. The first wines were stored and served in clay pots. Over time, ancient wine enthusiasts realized the clay wasn't doing anything for the flavor of the wine. It quickly took on the flavors in the clay and turned to vinegar. The first known glass decanters were used in Syria in 5,000 BC, but didn't come into common usage until the Roman Empire. From that point forward, decanters were routinely used for storing and exhibiting wines. However, the use of glass virtually stopped after the fall of the Roman Empire and bronze, silver, or clay decanters were used. Glass did not come back into common use until the Renaissance. It was during the Renaissance that the Venetians developed a decanter with a long neck opening to a wide body. This increased the amount of oxygen to which the wine was exposed. This is important because the contact between the wine and the oxygen allowed the release of the wine's aromas and enhancement of its flavors. Too much oxygen can cause a wine to deteriorate rapidly. In the early 1730s British wineries introduced decanters with stoppers so they could control the amount of oxygen in the wine. Very little has changed about decanters since this time. Many wines will benefit from some decanting, but the technique and length of time changes from type to type. Young wines need a longer decanting time because their flavors have not fully developed in the bottle. These are the wines that you want to get as much oxygen as possible into by the splashing technique. This is merely allowing the wine to rush out of the bottle as quickly as possible. Just hold it upside down over the mouth of your decanter and let the wine flow into it. Once decanted, leave the stopper off; the wine should be allowed to breathe for an hour before enjoying. Old wines also benefit from decanting but they should not be splashed. Rather, because of the possible sediment in the wine, they should be tilted over the decanter and poured slowly into the decanter, making a special effort to keep the sediment at the bottom of the wine bottle. Decant fine, old wines for 15 to 30 minutes before enjoying them. There is really only one actual type of decanter, and which style you use is totally an aesthetic choice. Lead crystal used to be very popular, however it has been found that the lead can leach out of the crystal and into the wine. This usually is a result of several days storage. Additionally, theater in the crystal can interfere with the ability to enjoy the color and clarity of the wine. 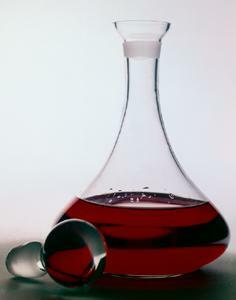 A plain glass decanter is perfect for enjoying the color and flavor of any wine. Using a decanter is simple, and anyone can do it. Although many people have been led to believe that you need special skills and knowledge to decant wine it simply isn't true. Even a beginning wine drinker can easily decant a wine. Give decanting a try. Take your favorite wine, pour it into a decanter, let it breathe a little bit and stand for a while, and then pour yourself a glass. See how the wine changes and develops with the oxygenation that the decanter provides. It's fun, and a great way to try new techniques for drinking wine.